Poking our opponents in the eye has never seemed to us a very productive posture. Cardus just turned 15 years old, which means that for a full tenth of Canada’s formal history, we’ve been speaking into its public square. Our donors and supporters will recognize the troika of adjectives to which we’ve always aspired: to be a public, credible, Christian voice. But the world of open discourse and rigorous debate is shrinking, especially for those holding minority opinions. As Cardus takes stock and plans for 2020 and beyond, we’ve identified that how we behave has been as important as who we are and what we say. Our acceptance is due in large part to our ability to accept. Over the years we’ve consciously cultivated hospitality—engaging honourably with those who disagree with us, even if wedges and labels would make for useful fundraising. It was a different world when Cardus was born in the fall of 2000. For Canada’s Liberal government, under the leadership of Prime Minister Jean Chrétien, environmental issues were hardly a blip on the radar. The growth of the oil sands and an energy economy looked very promising. The right was divided politically, and it seemed the Liberals would be in power for a very long time as Canada’s natural governing party. There was vigorous debate about society’s understanding of marriage. And, pre-9/11, only a curtain separated most airplane cabins from the cockpits. It was a different time. Michael, who was about to become Cardus’s first full-time employee, was working as the president of an Ontario chamber of commerce. Ray was immersed in the labour relations world. We had been friends since childhood, and our conversations at the turn of the century were beginning to reflect our frustration with the worlds of business and politics. Some of the voices, which were purporting to reflect our convictions for public life, seemed a bit off tune. There was too much thinking that was individualistic and celebrity-based, and not enough that was institutionally focused. We too had our heroes, but we realized that in the long-run, institutions are more influential than individuals. And so over years of conversations with hundreds of collaborators, we began to hatch the vision that still animates us: a think tank, representing the go-to reliable voice of 2,000 years of Christian social thought on the issues of the day. 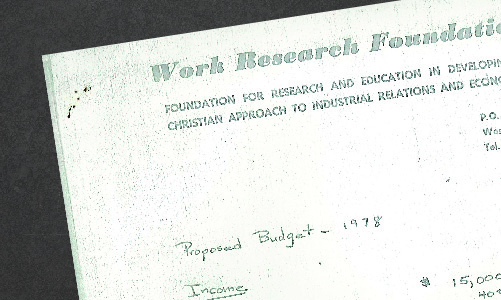 At the time, think tanks weren’t very common in Canada when compared to the United States, but no matter—an institution that was public, credible, and Christian had captured our imaginations. 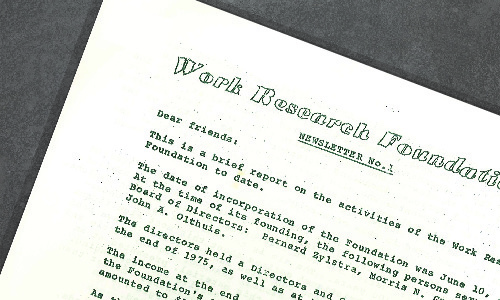 We set out (back then as “Work Research Foundation”) to be the articulate voice for faith that might infuse and inform public policy and public life. But from day one we sought a unique niche: we consciously decided that the “culture war” approach, in which supporters would rally around divisive, hot-button social issues, was not for us. Of course we had our opinions on social issues. But we neither wielded them as wedges nor hid them to get along or gain influence. We wanted to serve the public good, and it seemed to us that embodying Christian service in our approach, as well as our positions, was both more prudent and more faithful. Early on we decided that engagement and partnership with those who disagreed with us was an important metric of success. Canada is changing. Although a country with a distinct Judeo-Christian heritage, Canada has embraced a policy of multiculturalism, where people of many ethnic and faith traditions live alongside each other. It may not be the Canada our grandparents imagined, but we are learning what a respectful pluralism looks like. And the legacy of our Christian tradition provides us with meaningful tools to continue shaping the public space in such an environment. We describe Cardus as a Canadian think tank operating in the whole North American space because where Canada goes socially, the United States typically follows after a decade or two. Ours is a time in which articulations of orthodox faith are deemed marginal or even anathema to polite public conversation. This month our media are making a big deal of 9% or 10% of the Canadian population watching a Blue Jays baseball game. It may come as a surprise to some, but 11% of Canadians attended a place of worship last week, most of them orthodox Christian (6% Catholic and 5% Protestant) and other devout followers including Jews, Muslims, and Sikhs. None of these are second-class citizens, and none should need to hide their identity as faithful believers in order to be meaningful contributors to our shared public life. Cardus’s task is to promote and protect the space to make that a reality. This hospitality is hardly a straight-forward task. There remain some who nostalgically look back to times when the Judeo-Christian heritage of our nation was the unspoken framework within which public discussion could take place. Their agenda is one of “returning” to foundational principles that they hold dear, and so they cannot help but see those perceived to be undermining this (which today, they’d admit, would be the majority of the powerful) as enemies. And, yes, those in positions of leadership today typically view themselves as tolerant secularist champions. Protection of conscience is taking a back seat to enforced tolerance. Marching in a gay pride parade is becoming every bit as much a requirement for mainstream public square acceptance as church membership was a generation ago. So accepting a culture war paradigm and being forced to pick sides seems like a natural response. Cardus has taken a different tack. It’s not about us and what we believe, or you and what you believe. We all believe in something, whether we admit it or not. And so Cardus’s convictions have always been oriented toward encouraging the public good through protecting our shared public spaces and playing host to free and open discussions where competing visions and beliefs can move forward together. We are convinced that the insights that emerge from 2,000 years of Christian social thought contribute to our life together. And our research areas (work and economics, education, social cities, health, and law) are designed to prove it, using standards common to think tanks across North America. We are rooted in two beliefs: that this world is not what it was meant to be, and that the cross of Jesus Christ is the central defining event of human history. But from that starting point, we seek to contribute to our life together for the common good and also to benefit from those who do not share our foundational convictions. We understand that Sikhs, Muslims, Jews, and secularists (only to mention the most prominent, not to exclude any others) may not share our why, but none-the-less may appreciate our what and how. Our argument is one for a principled structural pluralism. We are working towards a healthy place for people to live out of their most deeply held convictions civilly and with respect for their neighbours. And yes, we mean neighbours—not strangers simply passing by and indifferent to each other’s needs, but neighbours concerned about each other and fellow citizens committed to providing each other the opportunity to flourish. Our commitment to pluralism should not be confused with relativism. We do not believe all foundational principles or faith commitment are equally valid. We come to our conviction as an expression of our own understanding of the world and how it was created; of brokenness and how the world has been disrupted; of the reality and presence of evil; of the hope that is provided by redemption; of a God who did not abandon creation but offered a way of salvation; and of a future in which the original purposes of creation will be restored. This is a Christian confession and by its very nature, lives alongside other confessions in contradiction. Yet we respect (and even fight for) the space for other articulations of faith to live alongside each other in this pluralistic present, not as the ideal ends, but as a meaningful way for human flourishing in the present even as we look forward to a better future that is promised. And so we proceed. Our employees, fellows, board, and donors have transformed a small dream into an institutional expression of the Christian faith in public life that can contribute to a conversation about Canadian pluralism, with lessons that will extend south of the 49th and well beyond. Our efforts are imperfect, but we press on for a better public life.